After I signed up for not one, but two nutrient dense, real food cooking eCourses, my life in the kitchen has dramatically changed. Thanks to the help of my super mom, I was able to buy a Vitamix to help me with one of the eCourse lessons, but also to simply make my kitchen more awesome. 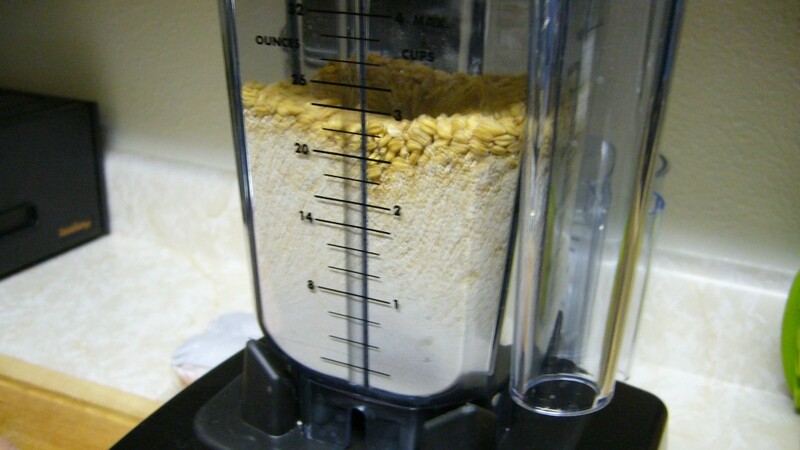 I make all sorts of stuff with my Vitamix almost every day: smoothies, ice cream, soups, sauces, and even fresh milled flour! This little machine sure packs a lot of power! If you asked me a few months ago if I wanted to mill fresh flour, I would have thought you were nuts. But here I am, milling fresh flour almost every week! Why? Because fresh milled flour means the flour and whatever you bake with that flour will be more nutritious. Flour that has been sitting around begins to lose its nutrient value, and after enough time, it really doesn’t have much nutrition in it anymore. Buying flour from the store can be tricky because you have no idea how long it’s been sitting on the shelf. 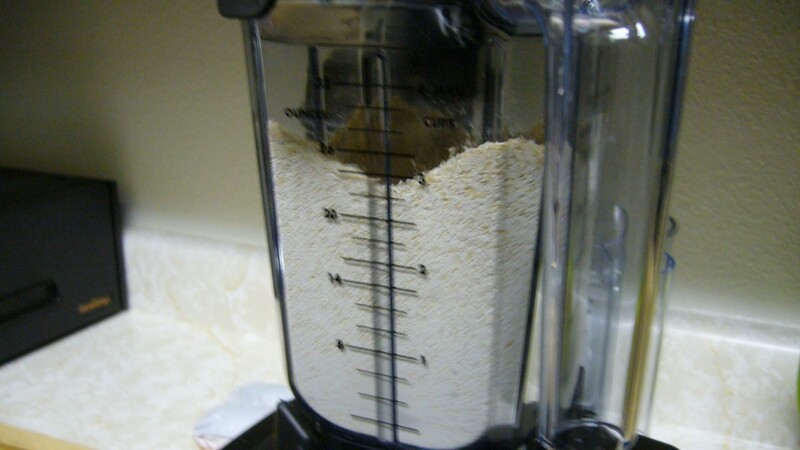 Plus, milling flour with the Vitamix is a breeze and helps save money on flour budgets, it only takes about a minute to turn two cups of organic whole grain berries into about 2.5 cups of fresh milled flour! Let’s take a look at how my first attempt at milling fresh ground flour turned out. I was planning to bake some muffins, so I needed whole wheat pastry flour. 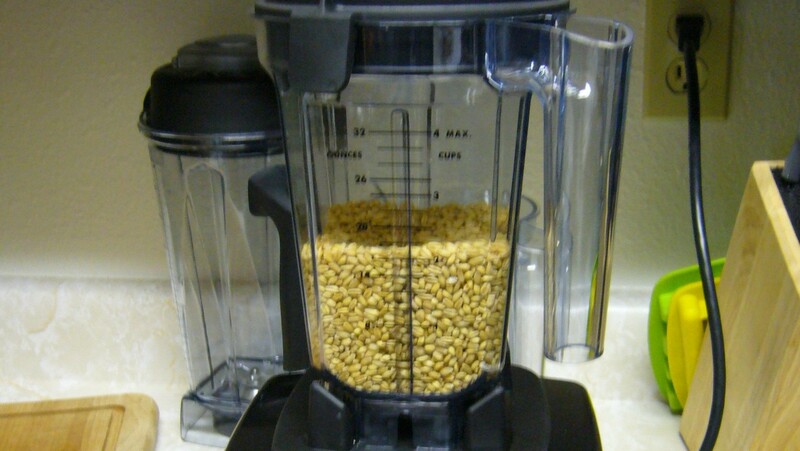 I threw in 2 cups of soft white wheat berries into my brand new Vitamix. Soft wheat berries turn into pastry flour. 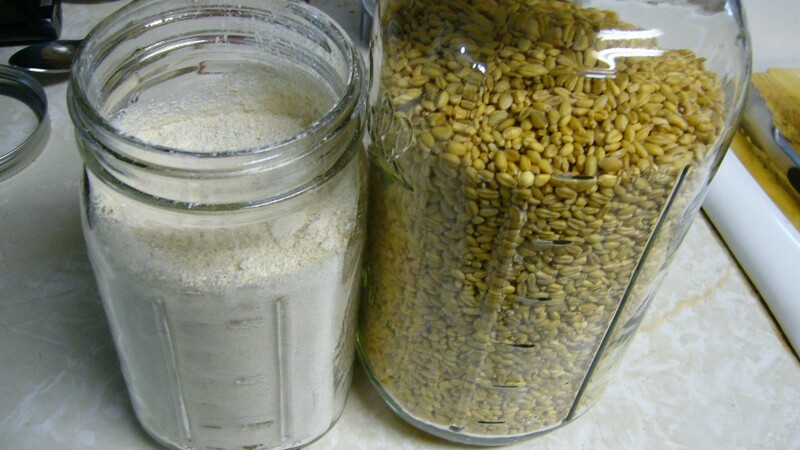 For regular whole wheat flour, you would use hard wheat berries. Next, I turned on the machine. 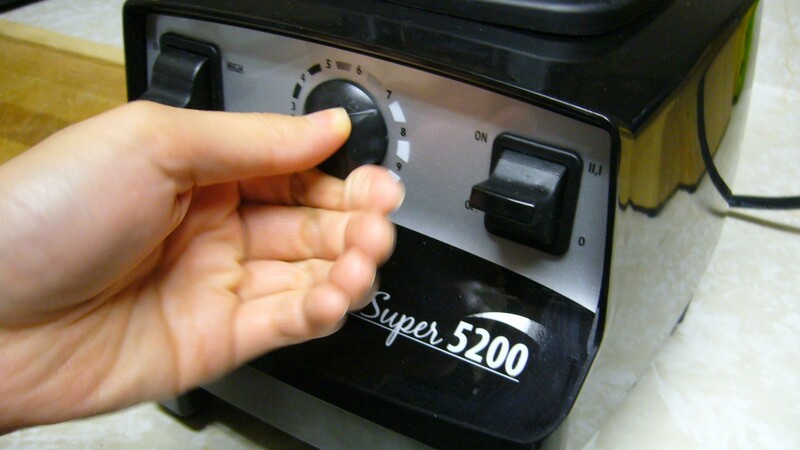 Here, I’m carefully cranking up the speed. You can see the wheat berries quickly turning into flour. I needed to constantly push down the grain/flour with a tamper so that the flour comes out consistent throughout. After about a minute of milling, I turned off the Vitamix. This is what the fresh milled flour looked like. Beautiful fresh grained pastry flour, ready to be used in a baked item! Do you mill your own flour? Are you considering it now that I’ve shown you how easy it can be with the right equipment? 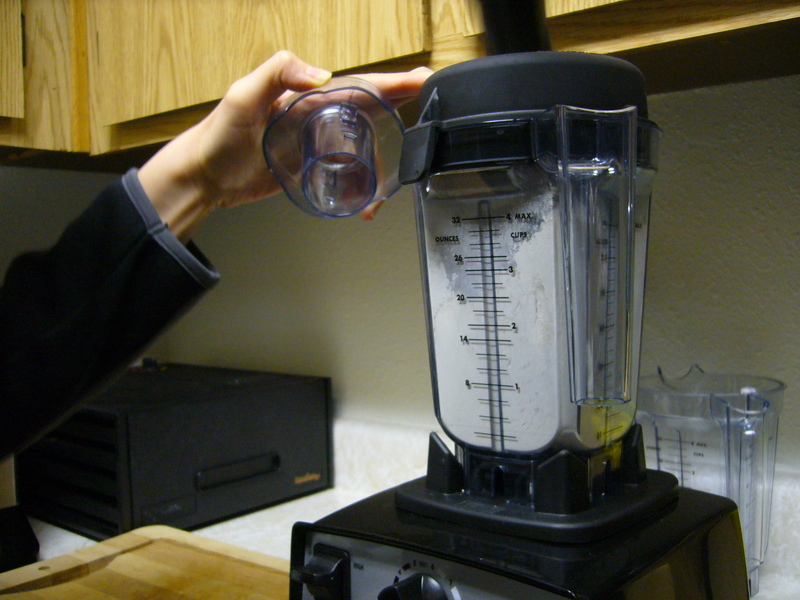 Do you have a Vitamix? What do you do with yours? Tell me about your experiences! Nice! I never even thought about milling my own flour! Me neither! Researching into real food and the Weston A. Price Foundation sure opened my eyes up to a lot of new things! I’m so impressed that you’re milling your own flour. 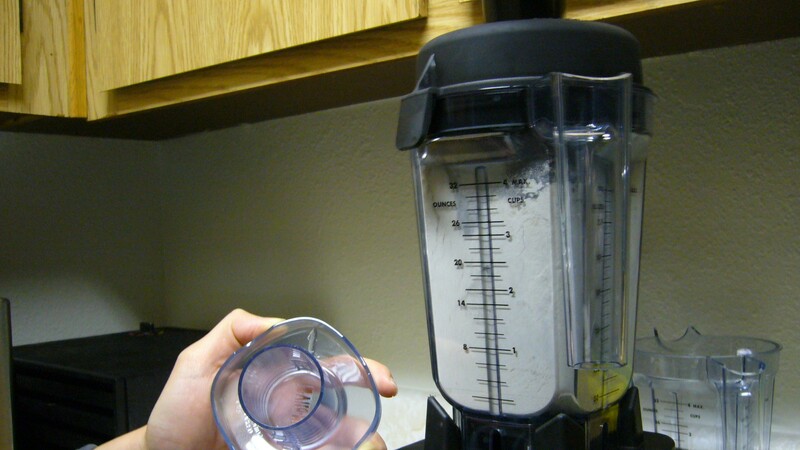 I know the benefits of it but don’t know if I can do it w/ my $20 Oster blender. Even if I could (maybe? ), I wouldn’t even know where to buy wheat berries. Just today I was at the store buying stuff for Ed’s Father’s Day breakfast (bourbon French Toast!) and was going to buy flour (because the other option was waffles) and I hated the idea of plunking down $6 for theoretically whole wheat flour that could be a year old. Only moderately related to your post, wow, bread is expensive. We almost never buy bread, so the idea of paying $4 for factory made, sliced, “whole-wheat” bread was kind of shocking. Makes me want to make challah again. 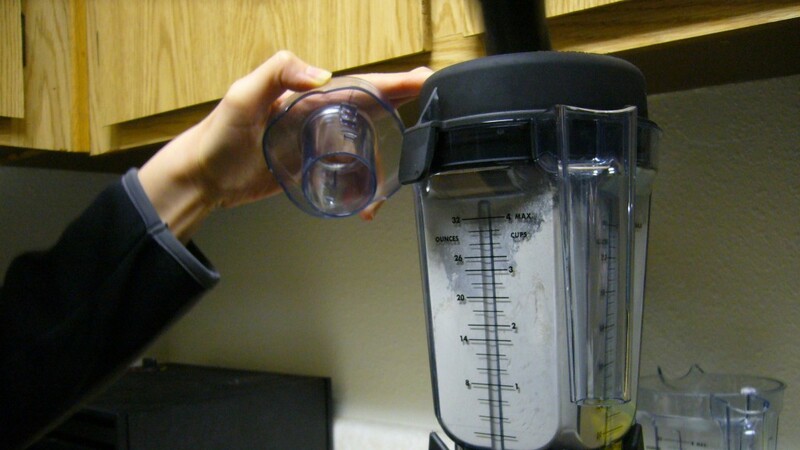 I don’t think it would work in a regular blender. If you are interested in saving up for a mill, the Vitamix is quite awesome because it is very versatile and can do more beyond milling grains. However, a good grain mill devoted to just milling grains is only about $200 or so. Either way, a grain mill is an awesome investment, despite being pricey. You can get wheat berries anywhere that has bulk bins. I’ve seen them at Whole Foods and similar health food stores. I’ve also heard awesome stuff about online stores like Azure Standard or To Your Health Sprouted Flour Co. You may want to consider getting sprouted flours from To Your Health as they have both whole sprouted grains and sprouted flours. Sprouted flours means you won’t need to grind your own flour and you can trust To Your Health have relatively fresh flours for you. Now that I am making more real foods in my kitchen, I’m constantly surprised by how much money breads and even bags of flour cost. Just buying a bag of whole wheat berries costs between $0.69-$1.69 per pound. They’re almost giving it away for free! I just made two loaves of sourdough bread the other week. Each loaf probably cost under a dollar each. And I could easily sprout my wheat berries and make sprouted bread, which costs $6-$7 for a very small loaf. I can’t believe I used to pay such high prices for bread like that! With prices like that, I can certainly justify the higher price of my Vitamix. Great stuff. But how cool is this? When a whole grain is sprouted and dried it is converted to a stable state. 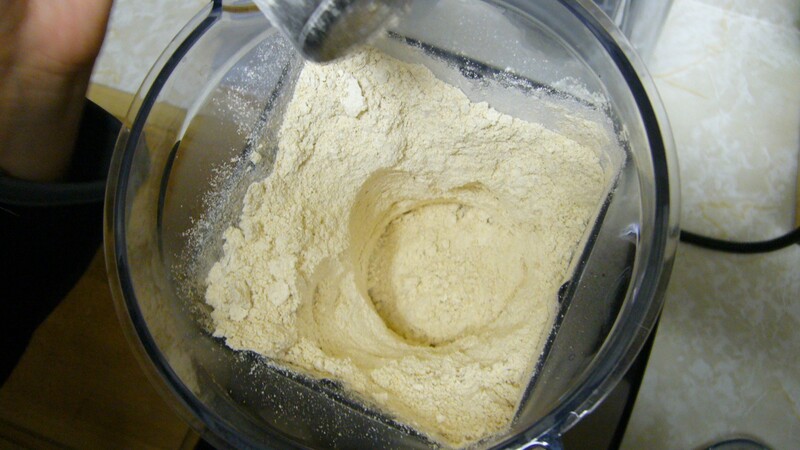 In traditional flour it is the germ cell, or the oil that begins to go rancid immediately when milled. BUT when a whole grain is sprouted the germ cell is converted in the process to grow the sprout so it is no longer in a state to go rancid. Sprouted flours do not have to be ground fresh and have a long shelf life. I use the Essential Eating brand as they are the only company I could find that tests to assure that their flour is sprouted and it has a shelf life of 9 months. I buy a 50# bag and share it with friends. It saves so much time, money and mess in my kitchen. Wow, I had no idea about this! Thanks Claire for sharing about this. I’m currently learning to sprout whole grains right now (a post about it will follow soon), and it’s great to hear that I could just mill that flour up and not worry so much about shelf life. It’s also assuring to know that I don’t have to always mill if I get too busy. I’ll definitely be looking into buying sprouted flours. Where do you find Essential Eating brand? Is it available to purchase online? Thank you for this post! I do not have access to ww pastry flour here. I can get it online, but I can also get the whole wheat berries online for a lot cheaper than the flour. I will be buying a big bag of it online to freshly mill in my vitamixer when I need ww pastry flour. Awesome, I’m so glad that I inspired you to mill your own flour. There’s nothing quite like making fresh baked goods with freshly milled flour!